B. WATER CLOSET PAN CONNECTED TO STONEWARE SEWER. C. STONEWARE SEWER PIPE SUBMERGED IN WASTE WATER. D. FILTER CHAMBER OR SOAKPIT. E. T CONNECTION FOR EFFLUENT OUTLETS. F. CONTAINER OF AQUA PRIVY. G. CONCRETE FLOOR SLAB FOR CONTAINER. I. OPEN SPACE IN TEH CONTAINER. 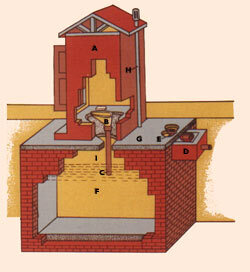 Aqua Privy is a modified form of Septic Tank. It is more useful where water carriage system is absent and availability of water is limited. There is no need to flush this toilet. This pucca latrine can be constructed on a smaller area with the tank below. The submerged outlet pipe serves as Water Seal. The Size recommeded for one family is 0.72 m. X 1.45 m. X 1.37 m. The wall thickness being 20 c.m. only. A 100 mm Diameter T-Connection is provided to take out treated waste water. The night soil converted into water flows out and could be used for kitchen garden or let out into a Soakpit or Soak Trench. In rocky areas, it sould be constructed above the ground also. The cost of construction varies from Rs. 2200.00 – 2500.00 only. The settled and digsted sludge may be removed (But not completely) after 5-6 years. It must be filled with Water before use.